I'm never without a product of theirs, whether it be a pampering product or a makeup item, you'll always find something Soap & Glory related in my everyday essentials. I was looking through my Soap & Glory collection last night and thought I would do a post about some of my favourites. I have other S&G products but some of them are half empty or the label is coming off so I've selected the ones that are still photographable (lol) and of course favourites of mine. It's rare that I would love every shade in a lip gloss range but all of these colours are beautiful. The colours are rich, the gloss is creamy and doesn't leave your lips sticky. 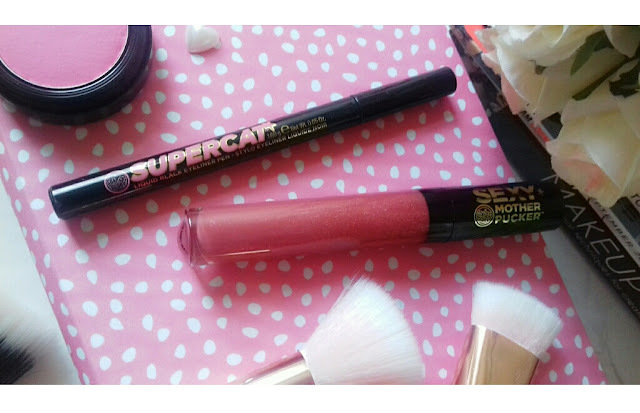 As well as giving your lips that extra wow factor, they leave them feeling super moisturised. You can also purchase and find out more information about these stunning glosses on the Soap & Glory website as well as other lip lovelies on there. I'm also a big fan of The Righteous Butter this skincare gem just glides onto the skin and leaves it feeling soothed, moisturised and like you just stepped out of a spa treatment. The scent is gorgeous too. You can treat yourself to The Righteous Butter (300 ml) from Boots for only £10.00. As well as The Righteous Butter, I'm also loving their Smoothie Star Body Lotion (£10.00 for 500 ml). This also smells lovely with a creamy, silky texture that just melts into the skin and doesn't leave a sticky or oily residue. I also have to say that I have sensitive skin which can get dry at times and S&G products have always worked wonders for me. I love the Scrub Of Your Life body scrub. The scent is beautiful and it always makes such a difference to my skin. I always feel great after using it. The body scrub retails at Boots for only £7.00 (200 ml). 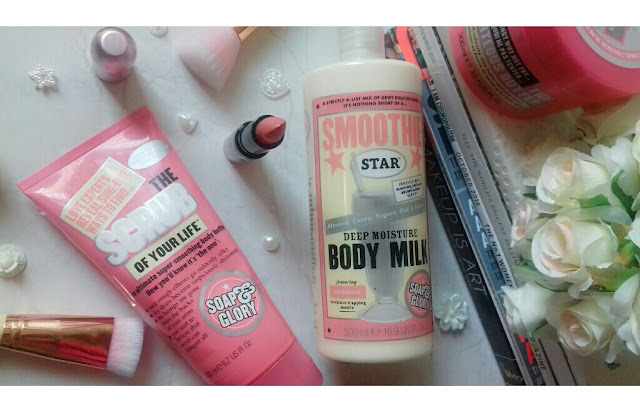 You can also find the body scrub on the Soap & Glory website. So many people had told me about the Supercat Liquid Eyeliner Pen and I thought I would try it for myself and now it has become my go-to liquid eyeliner! I love long lasting makeup and with this eyeliner, through wind, rain or shine it always manages to stay put and never smudges. - Love at First Blush Multi-Shade Blushing Powder (I'd show the inside of this gem but these products have just been grabbed out of my makeup bag and photographed). This lil beauty gives me a healthy, rosy glow that isn't too harsh and I love it! You can purchase this stunner at Boots for £11.00. For more information and to see the beautiful design inside the compact, you will find it on the Soap & Glory website. - One Heck Of A Blot What can I say about this product, it's everything!!! I can't leave the house without it and for someone who can fall victim to the dreaded shiny forehead, this is my saviour! You can find it at Boots for only £12.00 (don't you just love the fact that S&G products are fantastic quality but also super affordable) and on the S&G website. 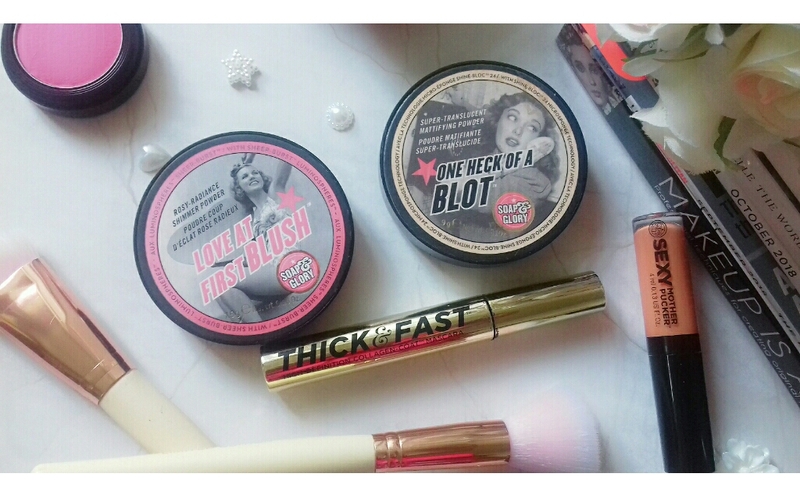 So, these are some of my favourites from Soap & Glory! Did you spot any of your everyday essentials in there? My birthday is coming up on November 5th (Bonfire night baby lol) so I'll be picking up some new skincare gems & makeup bits and you may see some more new S&G items in an upcoming post. *All thoughts and opinions in this post are my own and 100% genuine. This is not a sponsored or gifted post. All items purchased by me. All pictures are my own.